Posted April 1, 2015 by David Somerset & filed under Video lists. The eggstremely long wait for the new season of Game of Thrones is at last almost ova. Following the eggsclusive world premiere at the Tower of London last month, the eggsilerating Season 5 kicks off in the UK at 9pm on Sky Atlantic on Monday 13 April, airing less than 24 hours after the US premiere on HBO. For eggsample, you could rewatch the first four seasons? Shell out on some fancy Game of Thrones merchandise? Finally get around to reading the books? Work on your eggstravagant cosplay plans for this summer’s fan conventions? Or, if you’re NOW TV, how about recreating some of the show’s most iconic scenes and dramatic eggsxits from Season 1-4 with… eggs? And no, we’re not yolking. You can watch Season 5 from Monday 13 April on Sky Atlantic with a NOW TV Entertainment Month Pass. If you can’t wait until then, Seasons 1-4 can also be eggjoyed until 30 April. 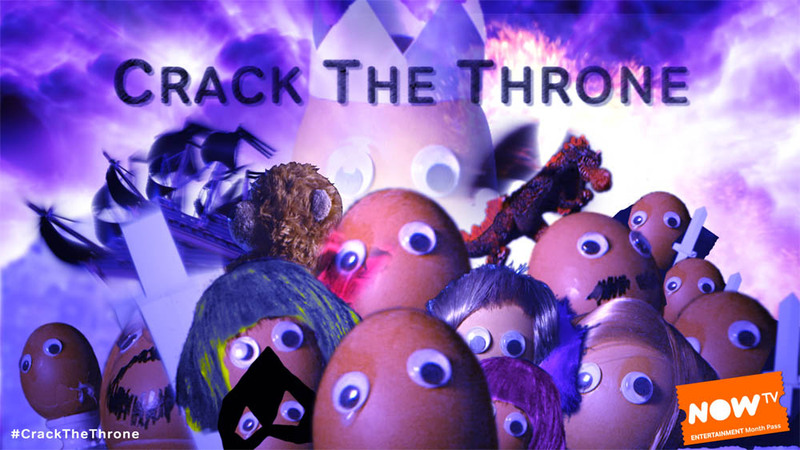 Make sure to join the #CrackTheThrone conversation with NOW TV on Facebook, Twitter, Instagram and YouTube to see more iconic Game of Thrones scenes re-enacted by the Eggsteros Am Dram Society!